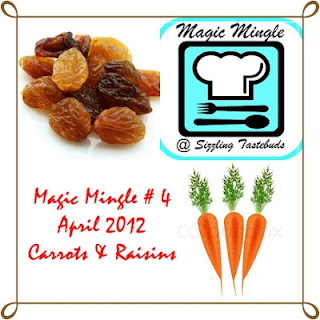 6) Once you post & link your entry (using the linky tool at the end of this post) between 5th & 15th of the month,mail the entry URL to the google groups email ID - magicmingle@googlegroups.com with the subject line "MM-April 2012". 7) Please note only member entries are accepted here. Others who are eager to join this group from April 2012 are welcome to write to me at the above email ID. Carrots are to be in fresh / frozen form. Hope you are excited and would link your entries soon.The round up of Magic Mingle # 4 shall be published shortly before the announcement of Magic Mingle # 5. Lovely combo as usual. Let me see what i can come up with. wow, such a great combination what can remind me is a sweet out of carrot. Seriously a super interesting challenge.. I sent an email to your group and google reported that your group does not exist. Wondering if I can join your group. Please let me know. Thanks.